Who needs a container? Texas goodies (all made in Texas) really stack up! Lamme's 6 oz. 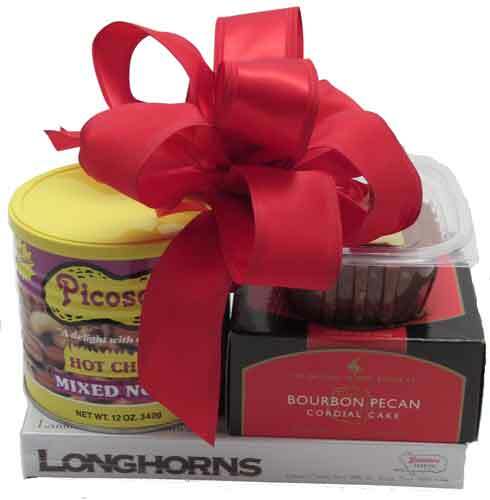 box of Milk Chocolate Longhorns (chocolate covered pecans & caramel), 12 oz. tin of Hot Chile Nuts, Bourbon Pecan Cordial Cake, and a half pound of Fredericksburg Creamy Fudge. Wrapped in crisp clear cellophane and topped off with a handmade bow. Includes a Handwritten Greeting Card.